Leeds, UK (April 12, 2019) – Leeds film fans can now enjoy the very best in cinema technology and luxury following the grand opening of the highly-anticipated ODEON Luxe Leeds Thorpe Park cinema. From today (12th April), the new cinema has officially opened its doors for business following a glittering gala evening last night, attended by hundreds of local dignitaries, media and business owners. ODEON and Dolby have partnered to bring film fans in and around the city the ultimate cinema experience with their brand new Dolby Cinema which combines dramatic imaging that delivers a spectacular, leading-edge visual experience through the Dolby Vision dual 4K laser projection system that brings the story alive with spectacular, ultravivid picture. It delivers twice the brightness, 500 times the contrast ratio, blacker blacks, and an unsurpassed colour palette, all in comparison to standard screens, all projected on a massive 19m screen for a vibrant, lifelike cinema experience like no other. The studio-grade Dolby Atmos immersive audio system transports viewers into the film with breathtakingly realistic dialogue and effects, filling the cinema with a soundscape that flows all around and above the audience. With the highest standards for technical design plus 263 Luxe recliners, every person will get a truly immersive and unforgettable cinematic experience, no matter where they are in the Dolby Cinema auditorium. Spoilt for choice, Leeds film fans also have the option of viewing the latest blockbusters in the cinema’s state-of-the-art iSense screen. Taller than a double decker bus, the screen measures 15m x 6.2m, and is curved to maximise light reflection, packing cutting-edge Dolby Atmos sound and 4K digital projector that delivers almost nine million pixels for an even clearer, ultra-high definition picture. The superior technology is combined with the ultimate luxury throughout the cinema including 971 handmade reclining chairs across the 10 screens and top-of-the-range food and drink options including lattice fries and chicken strips along with classic favourites such as sweet and salted popcorn and a Coca Cola Freestyle machine with over 100 different flavours to enjoy. The cinema also has an Oscar’s Bar serving a range of alcoholic and non-alcoholic beverages, along with freshly brewed coffee from the Costa Coffee station. Last night over 200 local community members attended a Gala evening to mark the opening. 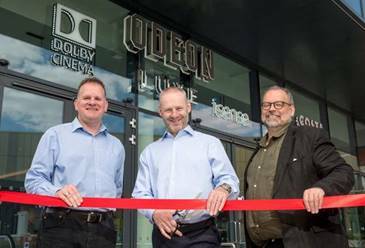 Attendees were hosted in a special reception where ODEON and Dolby representatives officially opened the cinema with a ribbon cutting and were given the choice of watching one of two films screened, Wild Rose orShazam! Locals are invited to check out the new cinema and all it has to offer, and from now until 30 May, ODEON will be offering a special ticket price of £5 per ticket, before 5pm Monday to Friday. Just in time for the school holidays! With more than 120 cinemas, over 950 screens and 87 years of cinema experience, ODEON is the largest cinema exhibitor across the UK & Ireland. ODEON is part of ODEON Cinemas Group, Europe’s largest cinema operator, which hosts over 115m guests each year in more than 360 cinemas across 13 European countries. In 2016, our Group was acquired by AMC Theatres, creating the largest movie exhibition company in the world with over 1,000 theatres and 11,000 screens globally.